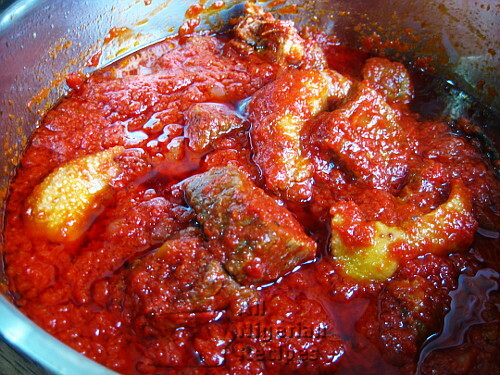 Nigerian Beef and Chicken Stew is none other than Tomato Stew with added ingredients. Though it is called Beef & Chicken Stew, feel free to use Turkey, Fish and other forms of meat and fish for this Nigerian stew. Rice: Nigerian Beef & Chicken Stew is the single most popular sauce when eating boiled white rice. Plantain: It is not unusual for Nigerian Beef & Chicken to accompany Fried Plantain or Boiled Plantain. Beans: Beans can be cooked plain and eaten with this Nigerian stew. 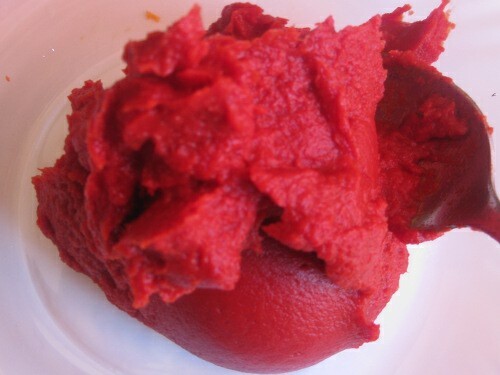 Yam: You can bring out the best in the yam staple by eating it with the beef and chicken stew. Boiled Yam and Fried Yam go really well with this stew. 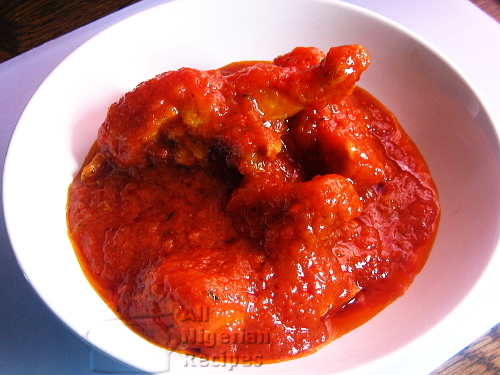 Nigerian Beef & Chicken Stew is usually a tricky Nigerian stew to prepare. If it is not sour or tasteless, it is burnt or too oily. Not to worry, just follow the steps below and you will learn how to make the best Nigerian Beef & Chicken Stew. Chicken: Hen (female chicken) is tastier than the cockerel or rooster so it is my preferred chicken when cooking all my Nigerian recipes. And I prefer whole chicken because each of the different parts of the chicken (wings, drumsticks, hips etc) has its own unique taste and all these together makes the stew (and infact all your cooking) taste better than if you use only one part of a chicken eg all drumsticks. 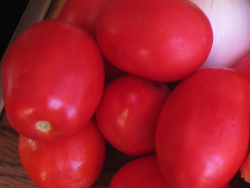 Tomato Stew is fresh puree tomato and the tinned tomato paste that has been boiled and fried to remove all traces of water and the sour taste of tomatoes. It is the base for the Nigerian Beef & Chicken Stew. Grind / Blend the chilli pepper and cut the onions into small pieces. Cut up the chicken and cook with half of the chopped onions, stock cubes and thyme. When the chicken is almost done, add the beef and cook till well done. Then add salt, allow to simmer for about 5 minutes, transfer to a sieve to drain. Grill or fry the chicken and beef. This is optional but it gives them a rich golden look. Add water up to the level of the contents of the pot when cooking the chicken. When cooking chicken, I do not add salt to the raw chicken. This is because salt closes the pores of the chicken (and infact anything you are cooking), this prevents the natural flavour of the chicken from coming out into the surrounding water and prevents the seasoning from entering the chicken to improve the taste. The result is that your chicken stock will not have a rich natural taste. It will only have an artifical taste of seasoning. Salt also hardens the chicken hence it takes longer to cook. I only add salt when the chicken is done. A lot of people think that adding salt early makes the chicken taste better but there's a big difference between a salty taste and a rich taste. I believe that what gives food a rich taste is not salt but the natural flavour of the food so allow this natural flavour to come out into your stock by NOT adding salt too early. And remember, stock cubes already contain salt so you really don't need more salt. I do not use curry powder to season my chicken (or beef) simply because in my opinion, curry powder overtakes the taste of any food it is cooked with (except Fried Rice) and makes the food taste so artificial. But if you don't mind it, feel free to use it as seasoning for your beef or chicken. When you are happy that the tomatoes in your tomato stew are well-fried, pour out the excess oil as I did in the video below. Place the pot of tomato stew back on the stove and add the chicken stock (water from cooking the chicken). There may be tiny pieces of bones at the bottom so be careful not to add those. Add the chilli pepper and the grilled chicken and beef. Stir very well and add salt if necessary. You can also add some water at this point if the stew is too thick. Cover the pot and cook at medium heat till the contents of the pot is well steamed. Stir again and you are done. That's how to prepare the best Nigerian Beef & Chicken stew. Use the beef and chicken stew to eat White Rice, Fried Plantain, Boiled Plantain, Fried Yam, Boiled yam and Agidi. Some people even add it to their Egusi Soup!